Heat your cells and media, not the stage. Finally a culture dish system specifically designed for live-cell microscopy! Now you can have accurate temperature control and high-numeric aperture compatibility in a convenient disposable culture dish system that even works in confocal applications. 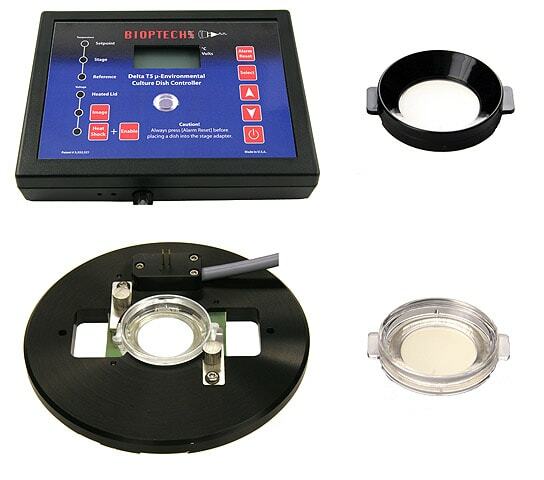 Bioptechs is now introducing the next generation Open Culture Dish Micro-Environmental Control System: the Delta T4. In addition to the improvements to the popular Delta TC3 control algorithm, Bioptechs has incorporated years of customer requests into the Delta T4. For a description of optional features, click here. The Bioptechs, Inc. Delta T Culture Dish System is designed to simulate host conditions on the stage of your microscope and provide an optimal optical environment for microscopy. This two-step system allows you to plate your cells and observe them without having to transfer them to another structure. The system components are the controller, stage adapter, and dishes. Accessories for Tissue Slice, Brain Slice, and other specimens are also available. An intelligent feedback loop passes an electrical current through a thin film coating on the underside surface of the glass substrate on which the cells are grown. Heat is applied directly to the cells without the inefficiencies associated with peripheral heating by traditional culture dish warmers. Bioptechs exclusively offers opaque culture dishes which eliminates the unwanted ambient light background for fluorescence imaging. The controller features a real-time temperature display and fast learning curve to compensate for cooling due to surface evaporation while responding to temperature changes due to perfusion. There is also an alarmed protection circuit to safeguard the cells and an internal reference for the user adjustable calibration. The standard controller has a temperature range of ambient to 50 degrees C. Extended ranges are available upon request. Delta T dishes have 35mm O.D. and a 23mm central aperture. The peripheral region of the dish is tapered to reduce the dead-volume and the height of the dish is 6mm to allow better access for micro-injection and micromanipulation. The dishes are a hybrid of polystyrene plastic and Desag 263 glass. The outer structure of the dish is available in opaque black or clear and come with a clear 0.5mm or no.1.5 glass coverslip bottom bonded to it. The dishes are also available in a plain glass unheated version. Low numeric aperture users need only purchase the basic Delta T with .5mm dishes. However if you are using high numeric aperture objectives (immersion) you will need the .15mm dishes. It will be necessary to regulate the temperature of the objective as well. In this case a Bioptechs, Inc. Objective Heater and an Objective Heater Controller will be necessary for uniform temperature across the field. Once you become familiar with its operation, you will find the Delta T an indispensable addition to your scope. Click here for a Delta T assembly and demonstration video. Click here for a PDF about Traditional Stage Warming with thermal images. To assist you and Bioptechs in selecting the most appropriate system to meet your needs, download and fill out this form of Micro-Environmental System Profile Questions.